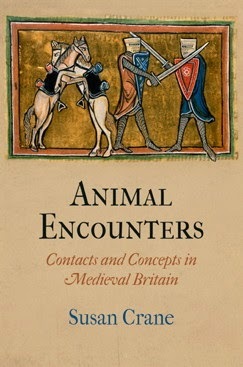 A highlight of this year's MLA Convention in Chicago was being included in a session on Susan Crane's new book Animal Encounters: Contacts and Concepts in Medieval Britain. The panel was jointly sponsored by two divisions, "Medieval French" and "Middle English excluding Chaucer." Sarah Kay presided, and the panelists also included Peggy McCracken and Robert Mills. Susan Crane responded to our papers and a lively conversation followed, with lively audience participation. Here's my piece. Let me know what you think. The allegorization of animals is deeply medieval. Bestiaries, romances and even scientific works transform them into human foibles, Christian virtues, and pedagogical injunctions. Susan Crane’s Animal Encounters refuses to discern in the beasts of medieval texts only anthropomorphism, only tropes for human stories. In the bestiary account of the stag (cervus), we are offered a potent sign for the good Christian. But Crane also demonstrates how we likewise behold the trace of a living deer that makes its way through dense woods, instructs its children, and retreats into its own wondrous world. She describes such moments of encounter and enmeshment as “embodied scenes of imaginative production" (1). Aside from brief glimpses of modern analogues and the anchoring of her argument in critical animal studies, her project is not explicitly tied to present-day concerns -- yet within the human-animal intimacies she investigates inhere new ways of forging relations between ecologies past and present. I taught Susan’s book alongside Mick Smith’s Against Ecological Sovereignty this fall in a graduate seminar on “Contact Ecologies,” and that juxtaposition emphasized for me how much the project of Animal Encounters, even if directed towards the medieval past, intimates new modes of environmental enmeshment and a densely cross-temporal ethics of encounter. The texts and topics examined in this capacious book include: the ravens, cats and wolves of early saints’ lives and monastic lyric as experiments in environmental cohabitation; Marie de France's charismatic werewolf Bisclavret as indeterminate creature, a challenging compound of wonder and adventure, extending an invitation to follow the animal to new realms; the taxonomic ardor of the bestiary tradition as a method of making knowable the spiritual unity of creation that also reveals continuities among its collected creatures, discovering in foxes, apes, and dogs qualities which are supposed to distinguish humans but instead render them humanely adjacent; hunting manuals for an aristocratic audience that simultaneously buttress the privilege of a select group of humans and sonically intermix them with the hounds they accompany through the woods; kindness capable of crossing the species barrier in Chaucer's Squires Tale, enabling a princess and a bird to construct, however contingently, a mode of compassionate co-dwelling; and the mutuality of relation between knight and horse in chivalric romance. Animal Encounters is learned, lucid, and cogent, yet another contribution to rethinking the Middle Ages from a scholar renowned for her ability to analyze polyglot and diverse materials in ways that profoundly change their critical estimation. This book opens up possibilities, and deserves enthusiastic celebration – prolonged, and with lots of champagne. Among the volume’s strengths is its insistence that Christianity is not monolithic, that the medieval theological record is diverse (too many scholars collapse medieval theology into a harmonized version of the Patrologia Latina). The materials examined here are in Latin, Old Irish, Middle English and medieval French, emphasizing the complicated multilingualism of the British archipelago (a polyglot world that extends in the book through hunting cries even to animal companions). What would the “Medieval Britain” of the book’s subtitle become, though, if the implicitly Christian ambit of its “Medieval” were widened? How might cohabitation change by following the pigs, owls, and hyenas that trace a liminal region between the book’s Christian authors and Jews, their English urban neighbors from just after the Norman Conquest until the Expulsion of 1290? As Karl Steel has shown, thinking the Jew and thinking the animal often went hand in hand. What would the subtitle’s “Britain” become if “Celtic” peoples were granted coevalness with the book’s late as well as early English materials? Could the Welsh and the Irish who appear in the first chapter as monks and saints also appear as late medieval writers? The tales collected as the Mabinogion are full of animals, sparse in monks, and with their Anglo-Norman traces certainly part of the contact zone that was medieval Britain. The twelfth-century discourse of race was also a discourse of species. We’re not talking abstract figuration here, but “embodied scenes of imaginative production.” To push this farther: what happens to taxonomy when humans and animals mate, engendering viable offspring? Gerald of Wales is provocative on this topic, especially as he describes the people of Ireland cross-breeding with their own cattle. He also asks questions like: what happens when a monkey mates with a dog? And we could add: what, outside of Augustine’s simplification of the issue, is the function of the species-blurring monster? These gems that grow and multiply, eat and thrive, are also susceptible to human domestication, true pet rocks. The Mandeville narrative quietly suggests that these gems are creaturely, that they belong with organisms that prowl the world, reproduce, ingest, desire. Depictions of fire rocks are almost never content to leave stone to seclusion, to add nothing of human story. Yet a surprisingly nonanthropomorphic, nonnarrative representation appears in the bestiary of Harley 3244 (at f. 60). Igneous red mixed with blazing orange, these five stones shine like embers on a grassy mountain slope. They are uniformly partitioned from each other, serene in their glow. [iv] The Harley fire rocks glimmer with vitality, but they have not yet ignited into cataclysmic story, unperturbed in their vibrant materiality. They hold themselves off from encounter (even while participating in visual contact). Other depictions of fire rocks are jarringly hybrid. 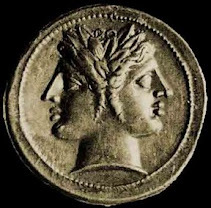 Another bestiary [Gonville and Caius College] illustrates firestones as two dark rocks, petal-like extensions framing the human faces at their centers, uneasily eying each other. They seem keenly to apprehend that something is about to arrive, but do not know enough to regard that fatal advent with anything but puzzlement. Rock is anthropomorphized not to become more knowable, not to be assimilated into the human or the creaturely, but to remove stone from that constrictive familiarity which prevents full realization of its challenge, even queerness. What might such animated objects have to say to the kinds of encounter and contact Susan Crane explores in their medieval diversity? What happens to “creaturely relationship constituted in compassion” (Animal Encounters 170) when the creature involved is not “the living animal” (171), but a lively thing, a stone? 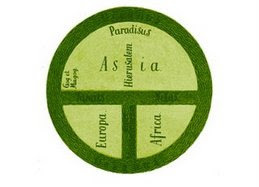 Might the “problem of animality” (4) be related more widely to problems of environmentality, including “how bodies, minds, and affects interpenetrate” not only “within and across species,” (9) but within and across ecomaterialities? What happens when animal encounter becomes environmental encounter, and grows to include the vastness of the material world with all its forces, organic and inorganic? Reading Susan Crane’s rich book provoked many such questions, and deeply inspired my own writing and research. What better gift can a volume bestow than the catalysis of new work, new thought? Animal Encounters is Susan Crane at her best, and that is really saying something. [i] I quote from the lively translation of Ian McLeod Higgins, 99. 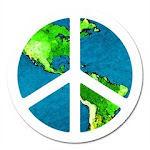 For the French see Jean de Mandeville, Les Livre des Merveilles du Monde, ed. Christiane Deluz 306. The Latin commandment from Genesis will be quoted on the island of Lamory, 332. [ii] Kellie Robertson acutely observes “These anthropomorphizing accounts of fire-producing stones suggest a natural world motivated by recognizably human desires and behaviors. The habit of moralizing rocks in this way seems to reduce the inanimate object to a screen on which the human is projected in grainy but recognizable form” (‘Exemplary Rocks” 93). Robertson argues against such reductive reading (rocks are more than humans in “petric drag”) by pointing out that “this allegorized world is one of mutual, rather than unidirectional, influence” (94): both rocks and humans are changed by their proximity and relations. [iii] Adamas introduces a lapidary bound with the bestiary. Vellum quality changes at this point and the lapidary section is not well illustrated. The adamas portrait may be unfinished. [iv] Debra Hassig describes the peaceful illustration as almost a landscape portrait: Medieval Bestiaries 117. Dorothy Kim pointed out on Facebook that the panel and the discussion that followed were tweeted, and can be found via #medievaltwitter. Winter is ...oh, never mind.